One of the major advantages of being a freelance translator is that you can work whenever and wherever you like. Some translators enjoy the comfort of their own homes while other prefer working at busy cafes or pubs. What about you? 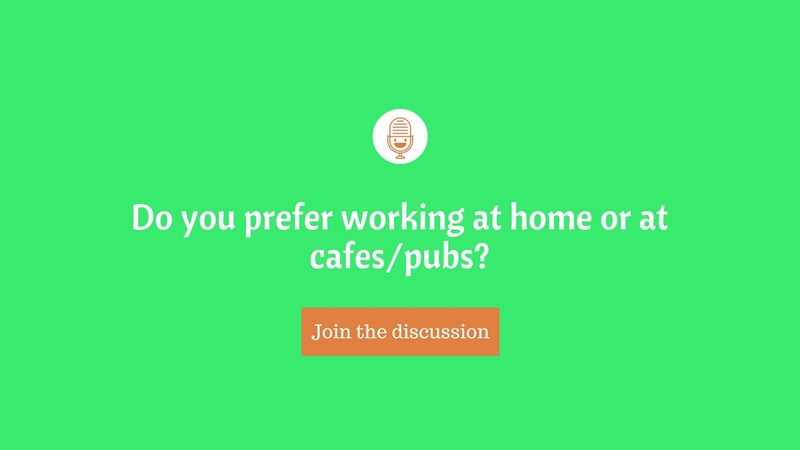 Do you work at home all by your lonesome or do you need to have people around you? Oh that's such a good question. Thankfully there are not shortages of quiet cafes and coworking spaces in the U.S. if you're someone who needs to have people around you. Personally though, I'm more often than not working from home (despite the tweet above, haha). If I had to be 100% honest as to why that is the case, I'd have to say that it really is just laziness AND I also don't like spending money on things that I can do myself (coffee, sandwiches, etc. ), so paying for my cafe bill always annoys me a little ($5 dollars for a small latte?! Come on!). Just like eleonorang though, I do feel the need to be surrounded by people once in a while. I have a tendency to withdraw from the world and only focus on work/school, so sometimes I force myself to get out of the house to make sure that I'm not completely turning into a hermit. KarenMontaldi I do have to say that my productivity is way higher when I'm at a cafe though. I think that having people around me who are focused and doing their work encourages me to avoid procrastinating. I just wish going to cafes everyday wasn't so damn expensive! Hey Karen, have you considered the idea of renting a desk or an office in a co-working space? KarenMontaldi I also don't like spending money on things that I can do myself (coffee, sandwiches, etc. ), so paying for my cafe bill always annoys me a little ($5 dollars for a small latte?! Come on!). eleonorang Hey Karen, have you considered the idea of renting a desk or an office in a co-working space? I am working from home although sometimes I feel that I become more introverted. Frankly speaking, I think it is a bit weird to go out from home to cafe for working. LindaLeuss I know! Especially in some cultures, cafés are almost exclusively perceived as 'recreation places' and associated with time off work, relax and so on This is also the reason why the concept of 'working in a cafè' is having a hard time getting established in some countries (such as Italy, as I mentioned above).